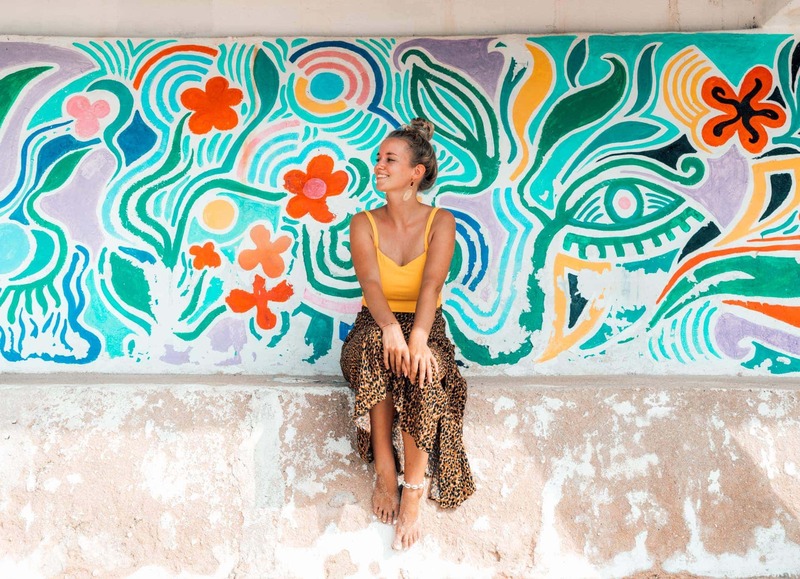 Uluwatu, the relaxed, trendy and off-the-beaten-path destination in Bali. 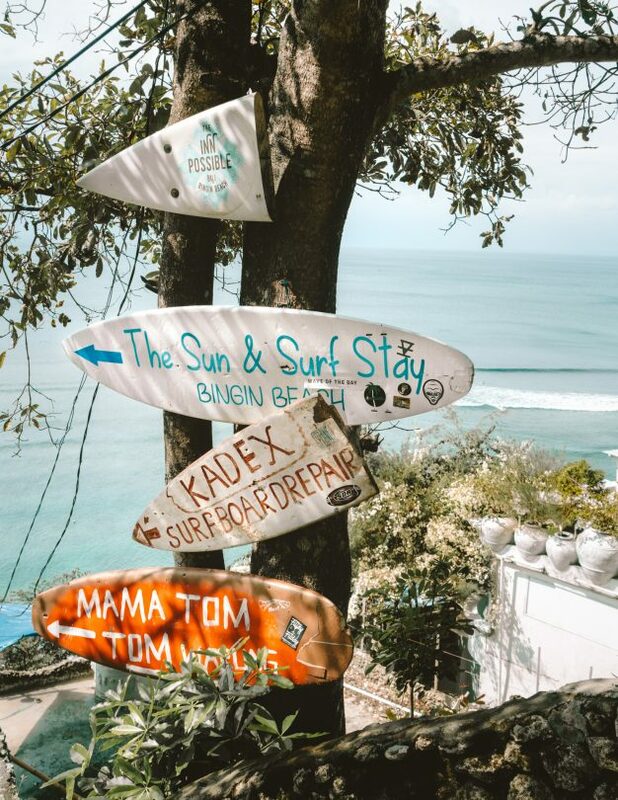 The hilly peninsula in the southern tip of Bali offers world-class surf breaks what makes it a mecca for surfers. 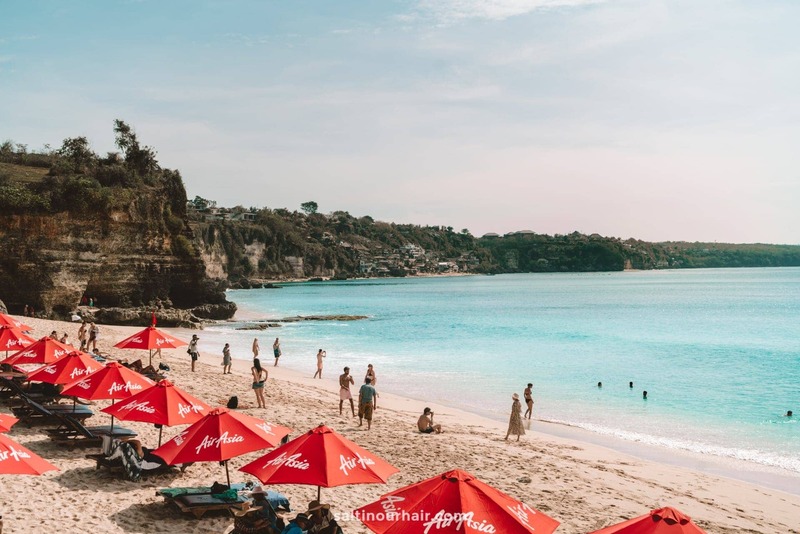 With the azure blue waters, white-sand and limestone cliffs like Nusa Penida, it can be easily said that Uluwatu owns the most beautiful beaches in Bali. 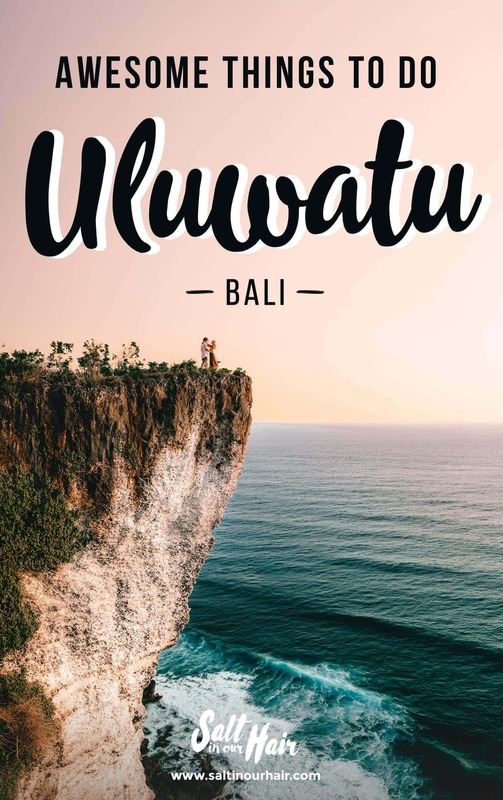 Find out about all the things to do in Uluwatu in this full guide. 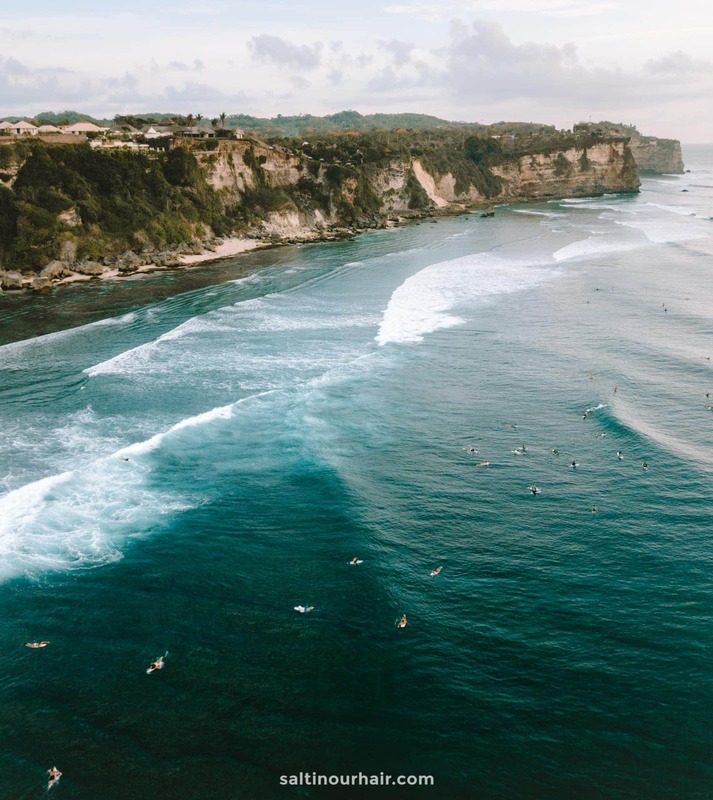 Uluwatu is away from the big busy cities like Kuta and Seminyak. The roads are straightforward and quiet and easy to explore by motorbike. The viewpoint on the northern tip of Balangan Beach provides a panoramic view over the 200-meter wide beach. 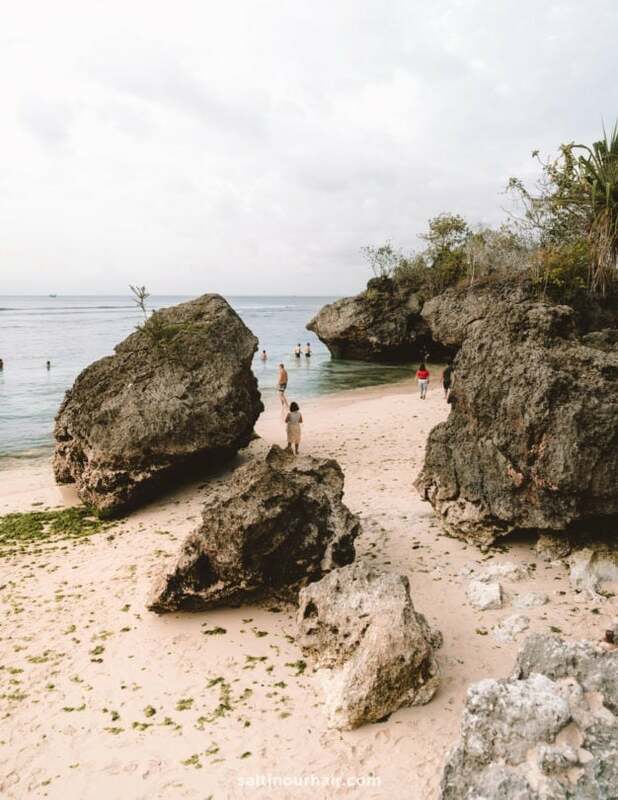 Balangan Beach is popular for both surfing and sunbathing. During sunset, a handful of wedding photographers are working at the viewpoint. You might want to avoid this by visiting earlier in the day. 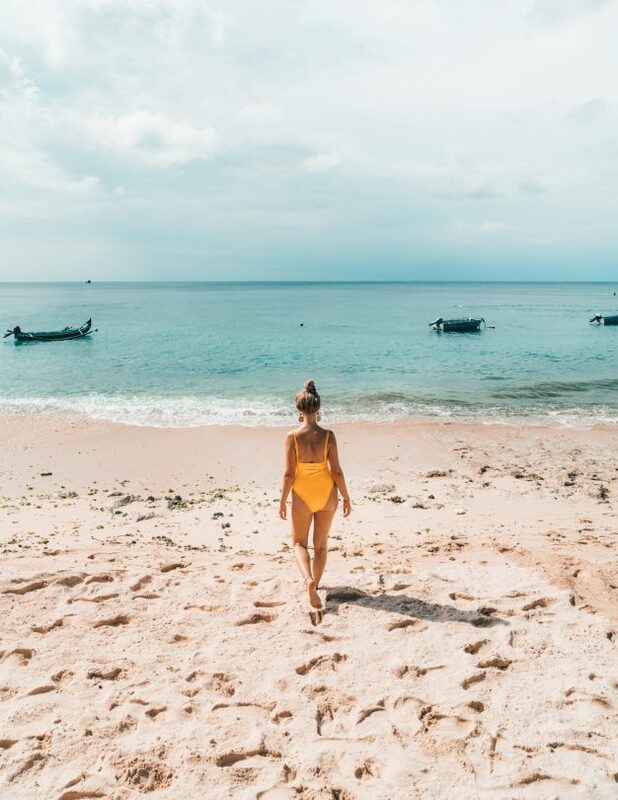 Nyang-Nyang Beach is one of the most beautiful beaches in Bali. 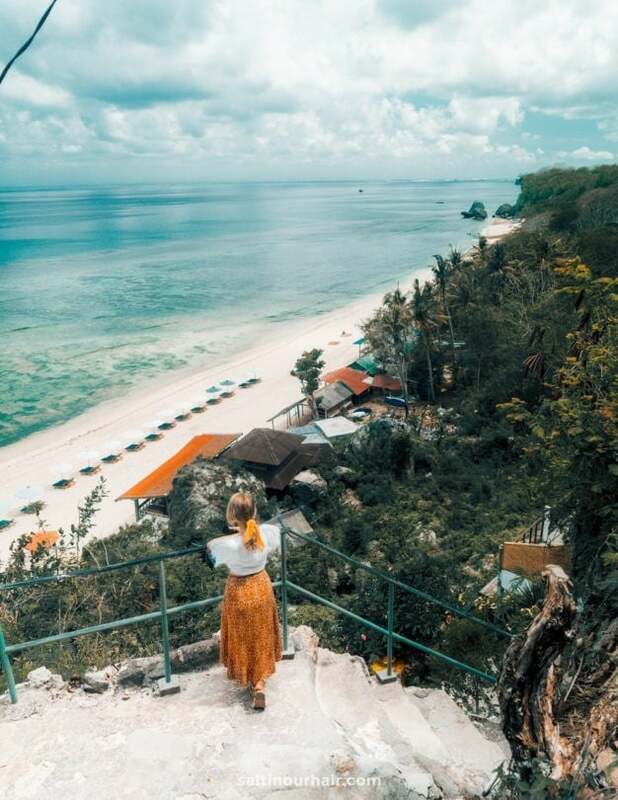 A 1.5-kilometer pristine white sand beach along the limestone cliff coastline. Nyang-Nyang has almost no visitors because is it hard to reach the beach. 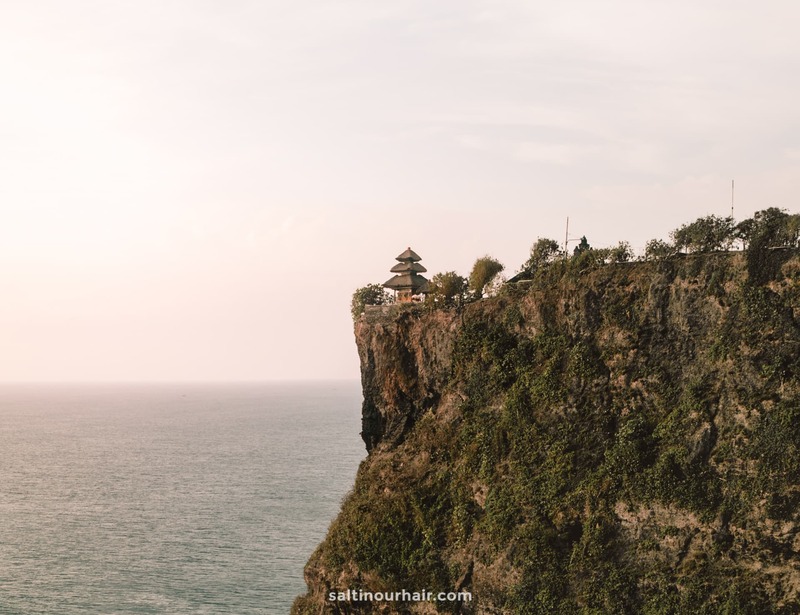 One of Bali’s most scenic temples, build on top of a 70-meter high cliff is Uluwatu Temple. 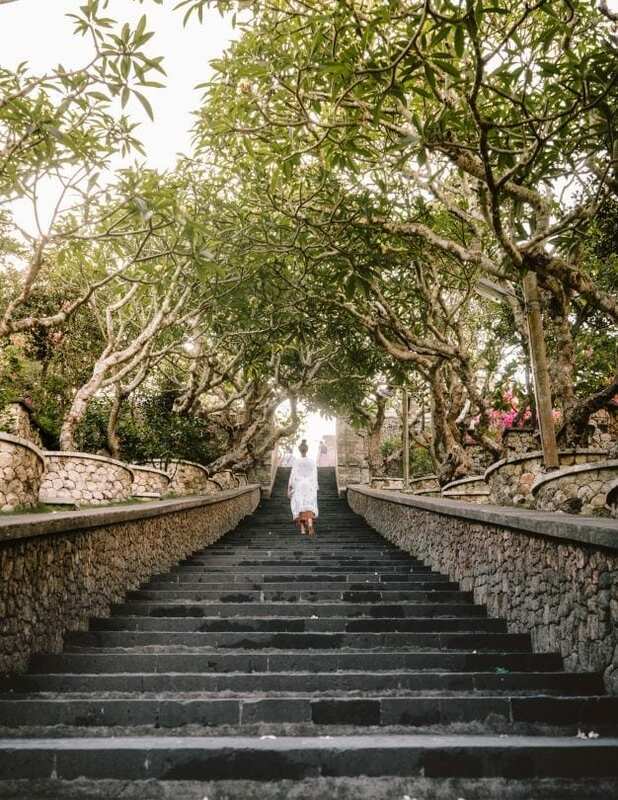 The entrance fee to Uluwatu Temple is 30.000 IDR. Good to know: No drones allowed. 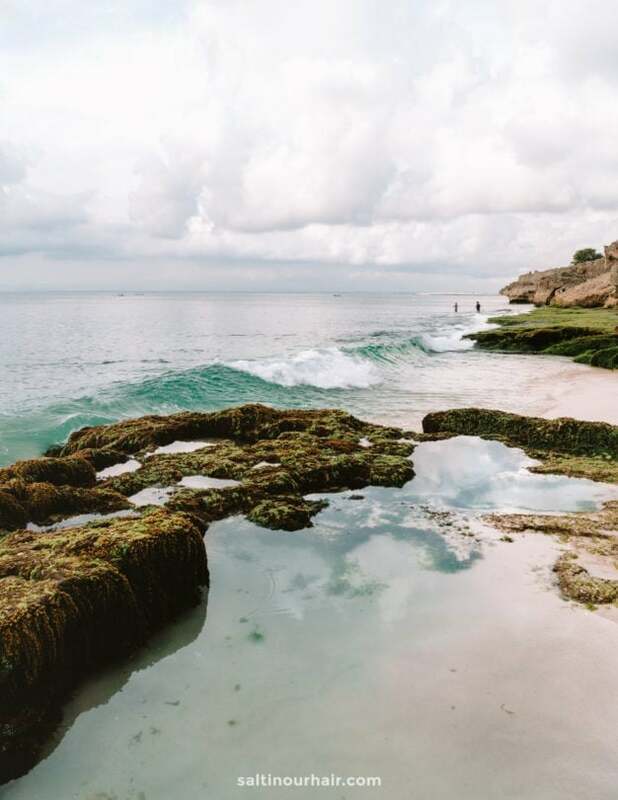 A beautiful white-sand beach tucked away and so quite unknown. 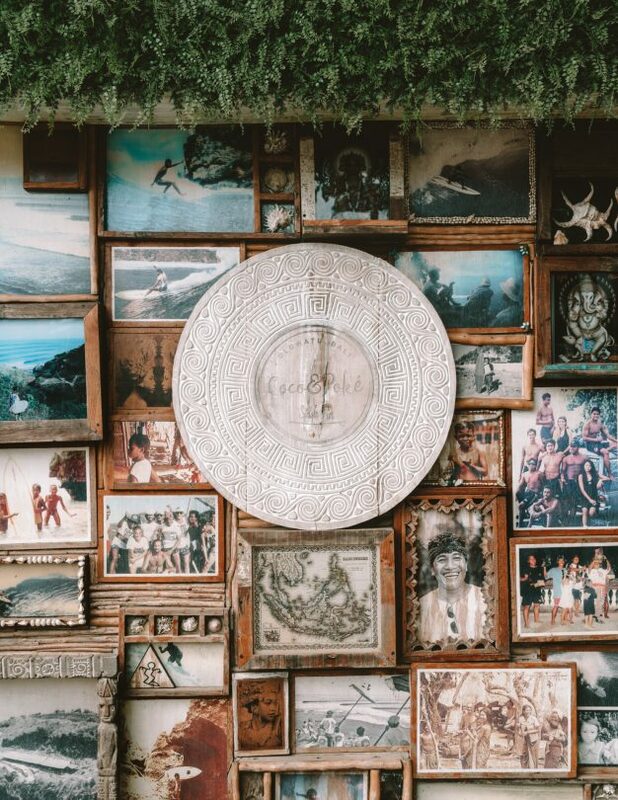 It has a handful of small beach bars who sell coconuts and rent surf or paddleboards. When entering the beach via the stairs from the top, the beach really looks like a gem. Thomas Beach in Uluwatu was our personal favorite beach to relax. 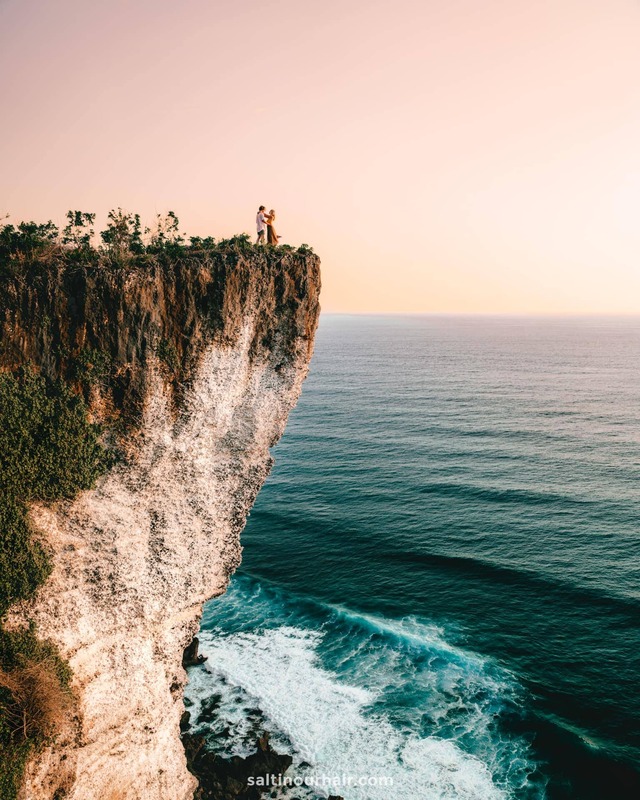 A jaw-dropping 70-meter high limestone cliff, straight down into the ocean; Karang Boma Cliff, better known as Uluwatu Cliff is located near Uluwatu Temple and is a fantastic place to visit before sunset. 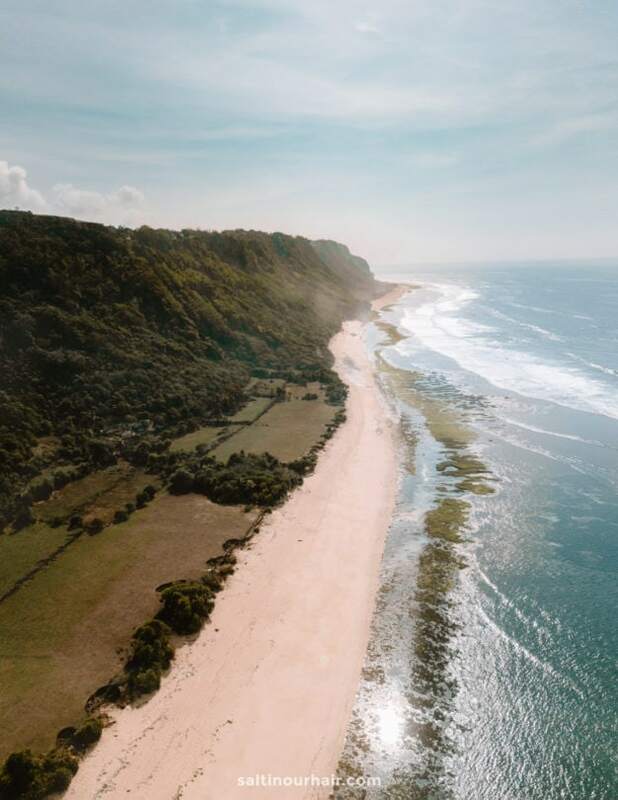 Karang Boma Cliff is one of those places you must-see in Bali. 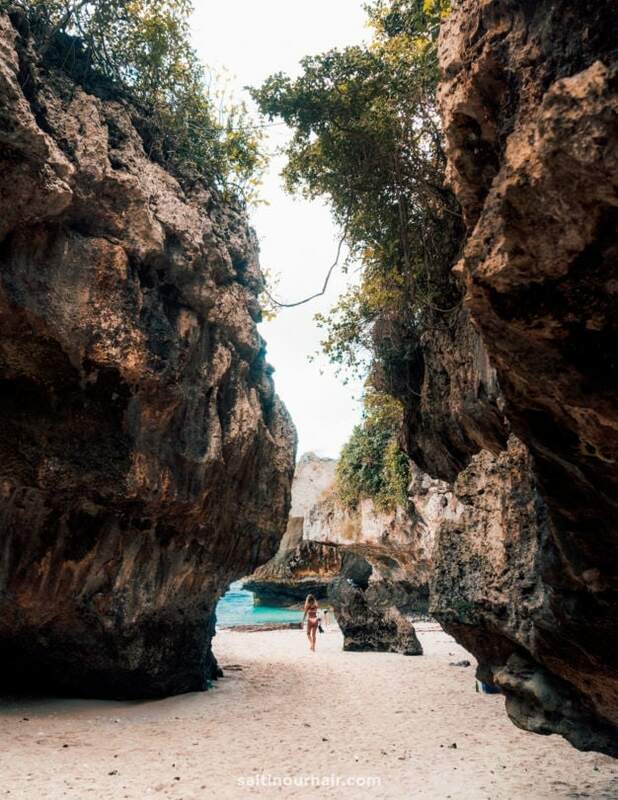 Bingin is a quiet hidden beach that can only be entered via a small alley followed by a 5-minute walk down via the stair. The beach is great for sunbathing and having a drink at one of the beach restaurants. 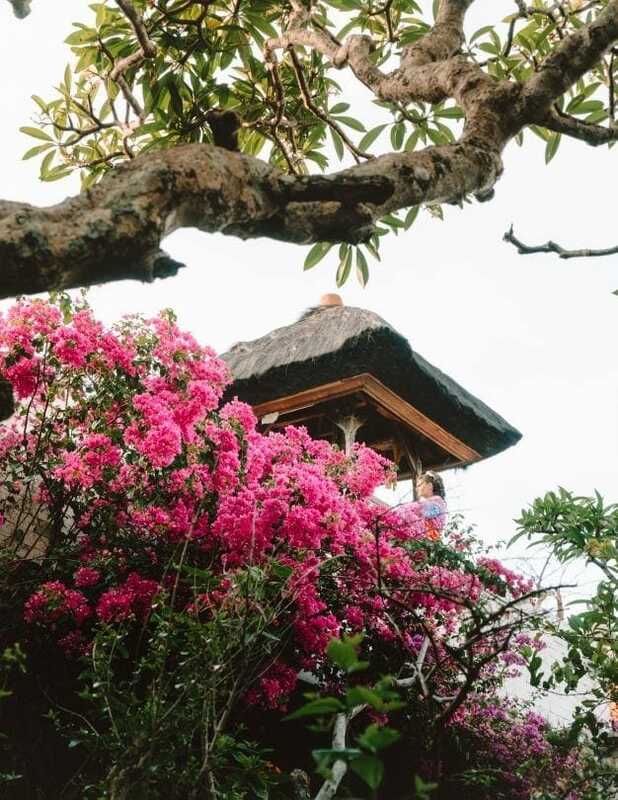 On this prime location, there are a handful of hotels and guesthouses that offer a beautiful view to wake up with. 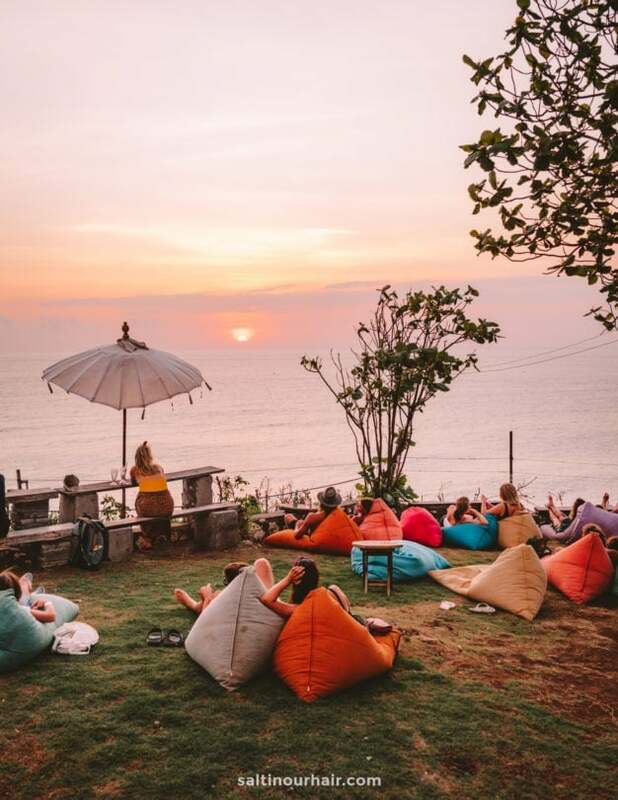 Grab a drink, beanbag and enjoy the views are Sunset Point. 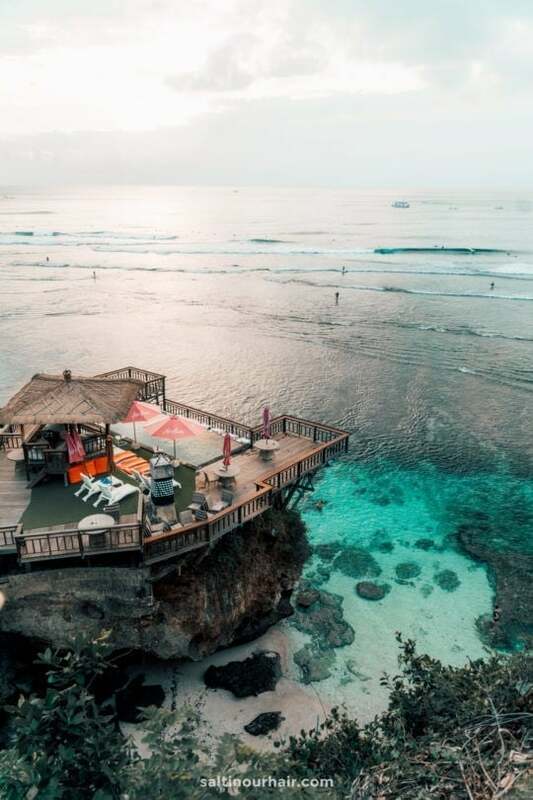 The bar in Uluwatu has a pool and bar on a prime location. A small sandy bay that once got popular because of its feature in the movie ‘Eat, Pray, Love’. 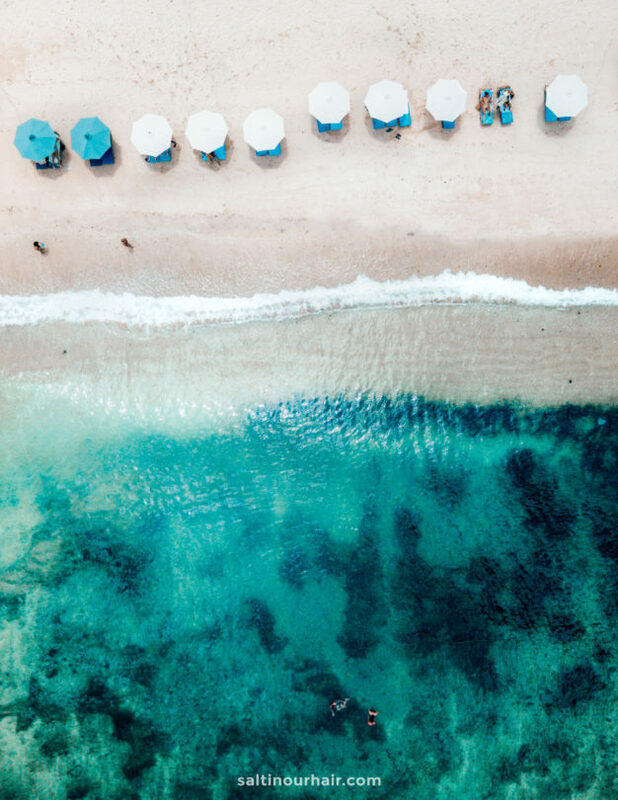 The beach itself has a lot of umbrellas for sunbathing and relaxing. 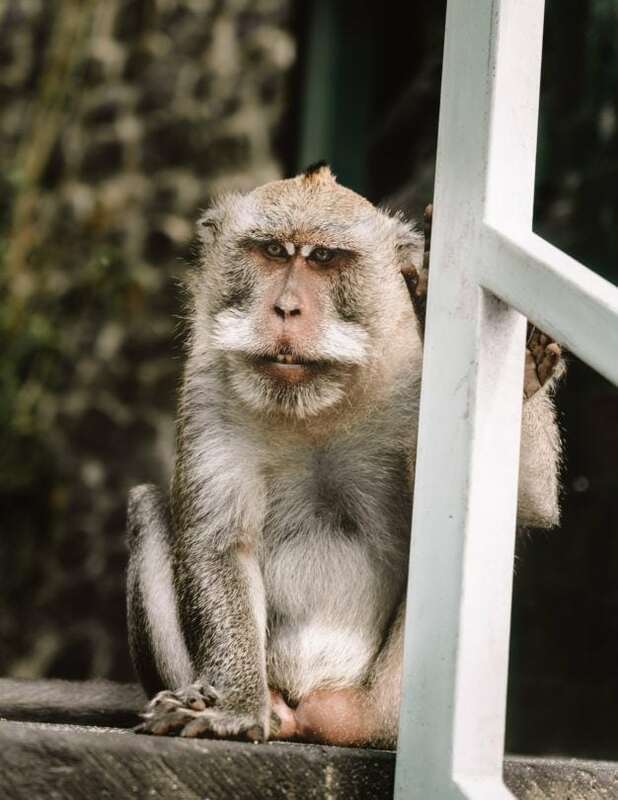 It is an easy walk down where you will meet a lot of monkies. Don’t worry, they are not interested in you. 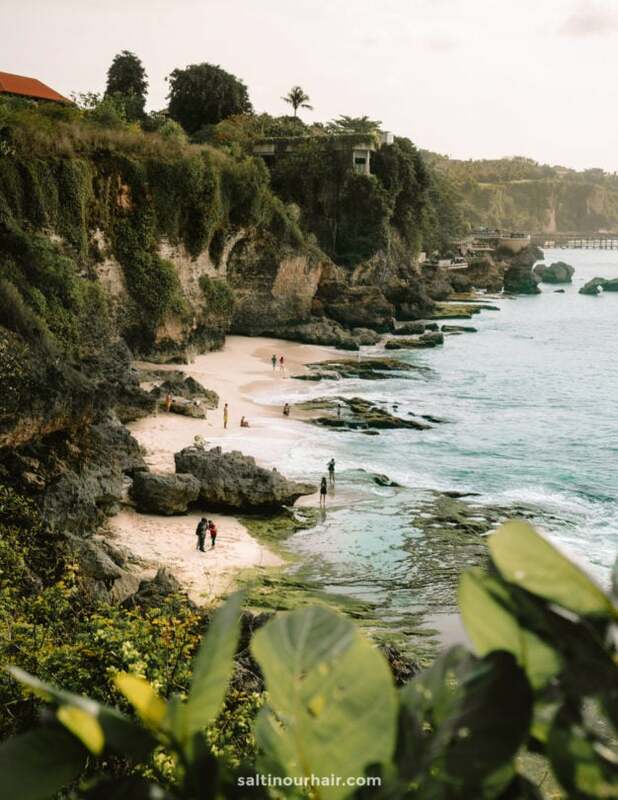 The entrance to visit Padang-Padang beach in Uluwatu is 10.000 IDR (0.75 USD). 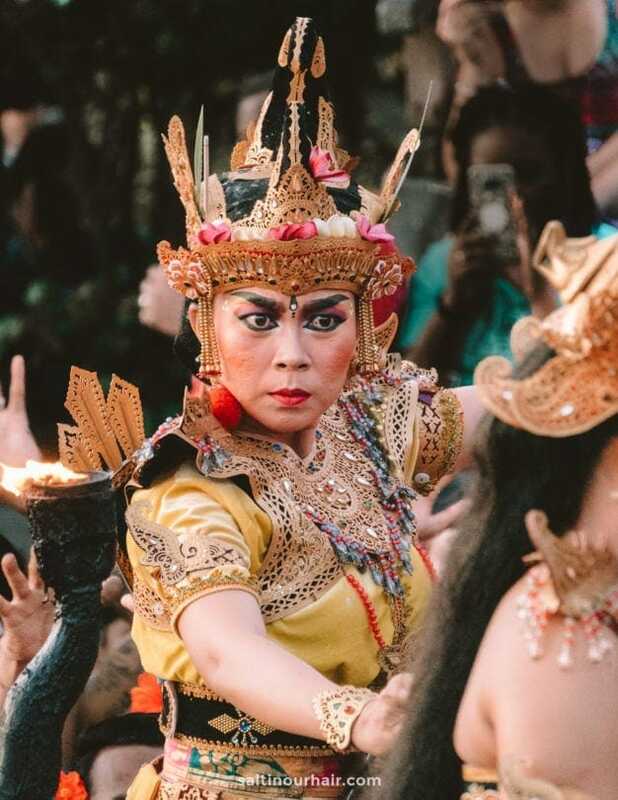 The Kecak Fire Dance is an iconic dance performance in Bali. A group of 65+ human vocals acts as instruments that strength a story told in form of a dance. 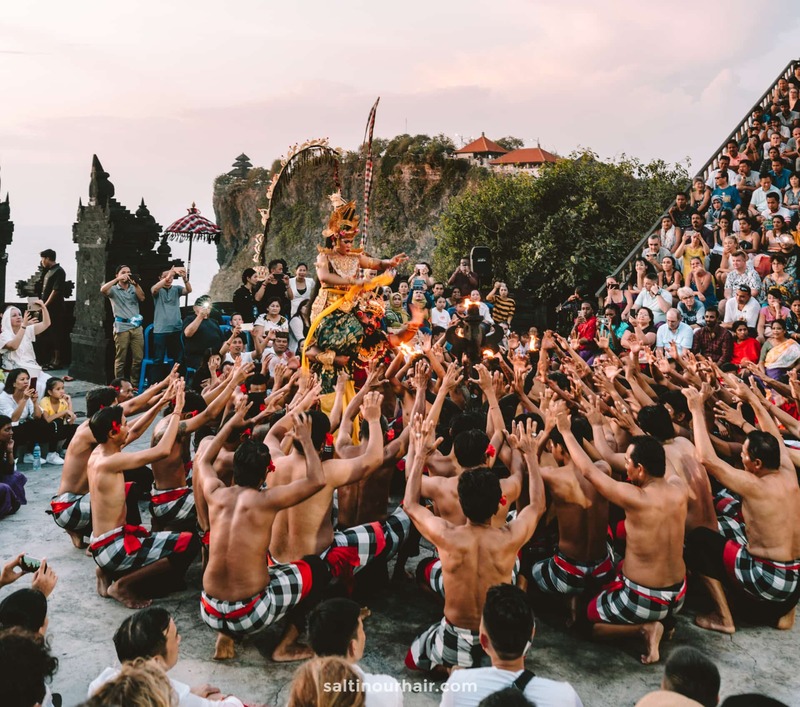 All of this happens during sunset time on a cliff-top amphitheater inside Uluwatu Temple complex. 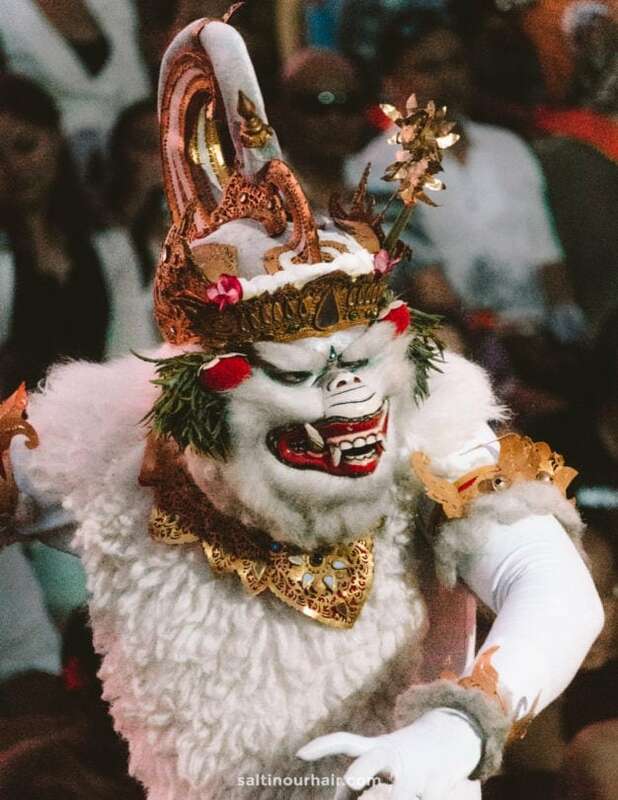 The show was incredibly impressive and we think your 3-week Bali Route isn’t complete without this experience. It is from 6 – 7 PM and costs 100.000 IDR (7 USD) per person. Tip: Make sure to buy a ticket around 5:30 PM since it usually sells out. 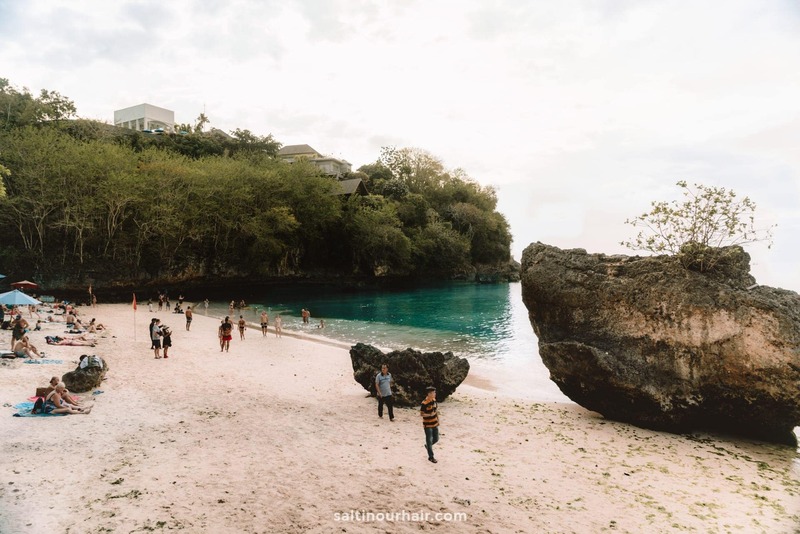 Suluban Beach is on everyone’s list of things to do in Uluwatu. The actual beach has a shipwreck on it and is only accessible via a small hole between the rocks. The surfing point, named Blue Point is incredibly popular with surfers which can be entered via a cove. 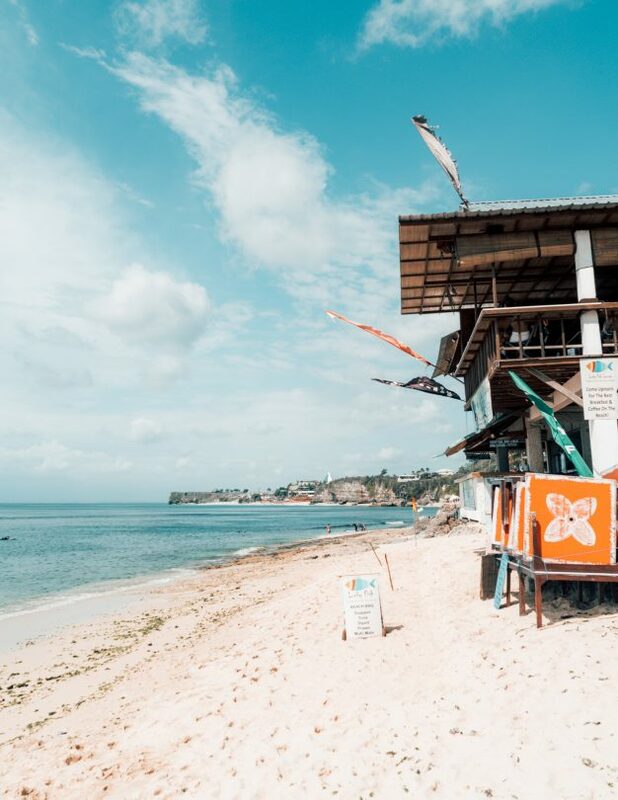 Single Fin is the most popular cliff side bar of Uluwatu. It is located on the walk down towards Suluban Beach. 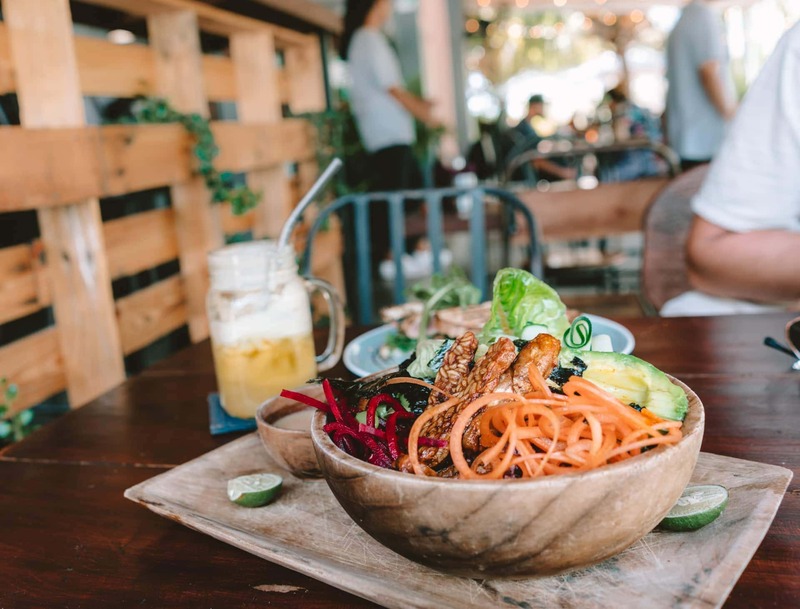 Single Fin’s is good for a drink, snack, relaxing vibes, and a great sunset. Sundays are usually busiest where they organize parties with live DJ sets. 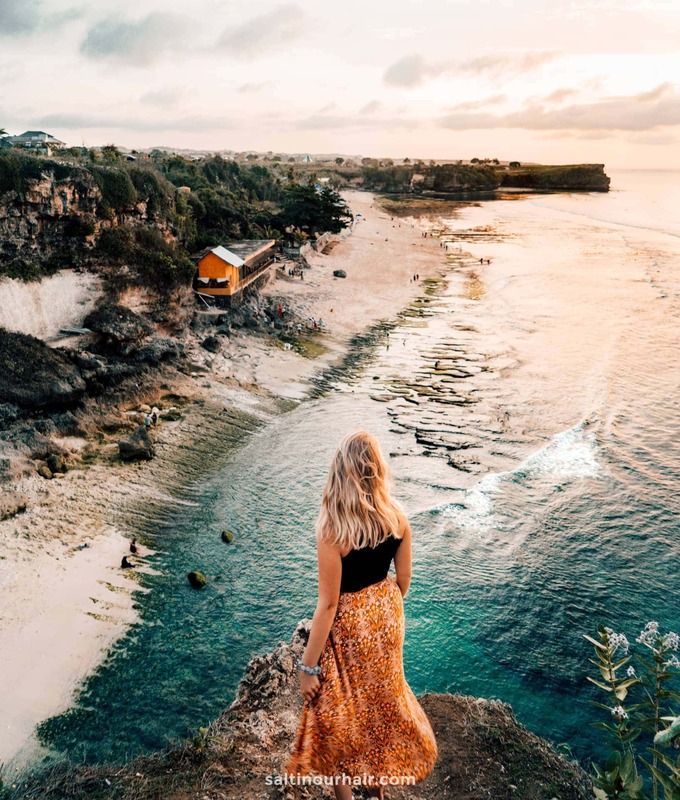 The cliffs at Pantai Tegal Wangi are a popular sunset spot for both locals and tourists. A small stairway leads down to a white-sand, almost secluded, small beach. 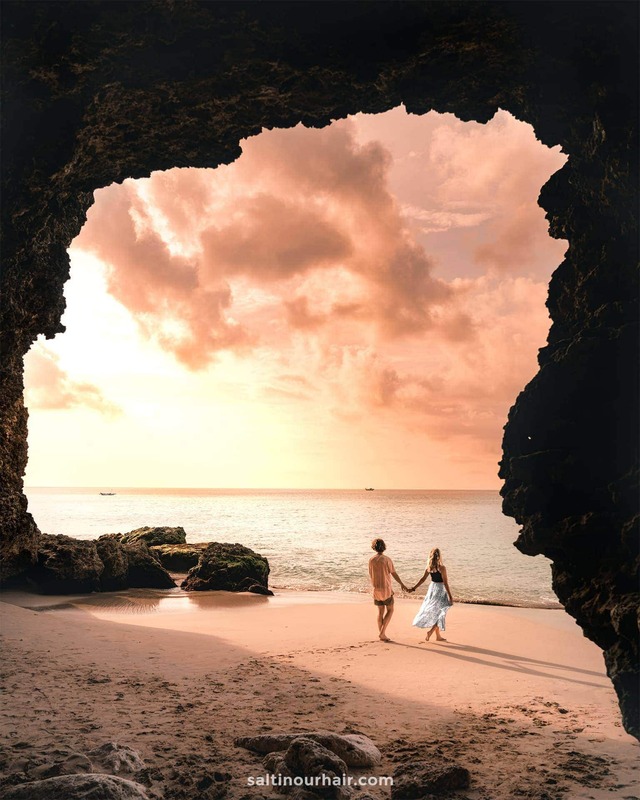 On this beach is a cave which is a great place to take a photo during sunset time. It is not recommended to visit this during high tide. Uluwatu is surfing. 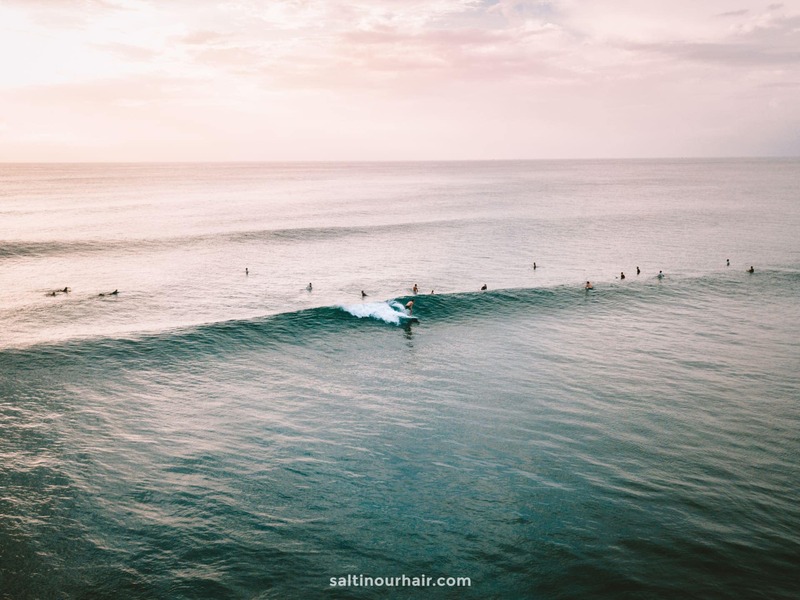 Surfers from all over the world come to surf on the world-class surf breaks. These are all break for experienced surfers. The easier waves are found at Dreamland or Padang Padang. 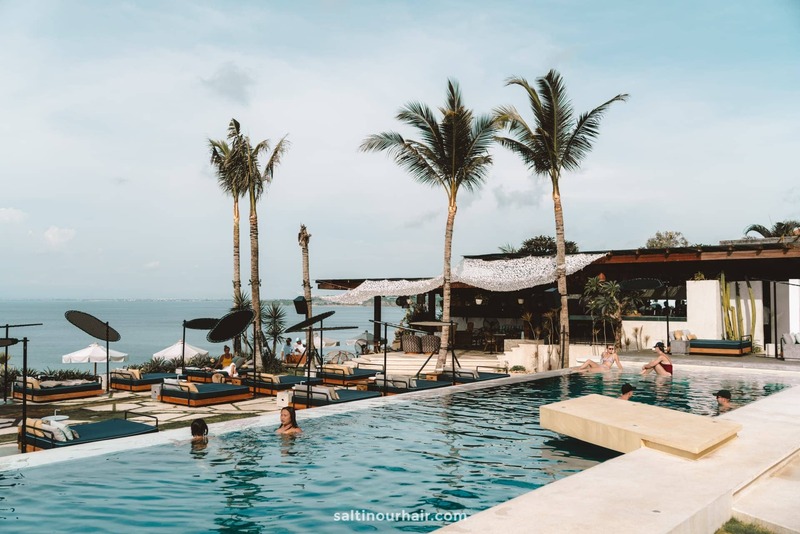 Ulu Cliffhouse is a brand-new beach club on the cliff-side overlooking the ocean. The well-decorated beach club has super comfy beds to relax and a big pool to spend your afternoon. 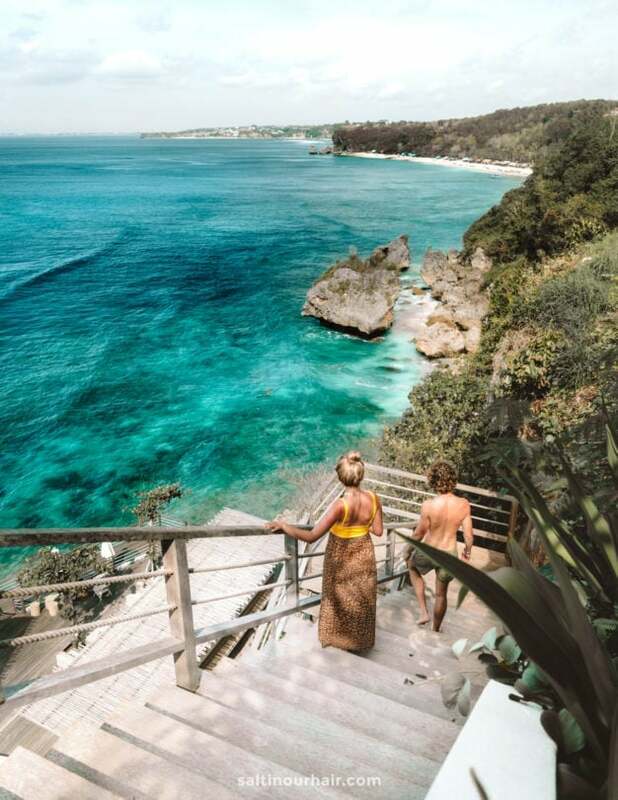 The second part of Ulu Cliffhouse, called Ocean Deck is accessible via a wooden stair down to the ocean along the cliff-side. Dreamland beach is popular with beginner surfers and sunbathers. There are a lot of shops and small beach clubs located near the beach to drink or eat. We personally found this our least favorite beach in the area. GWK Cultural Park is a huge park used for music events, exhibitions and conferences. In September 2018, a 121-meters tall bronze statue of Lord Vishnu was revealed inside the park. Due to political issues, it took 30 years to finish the statue! 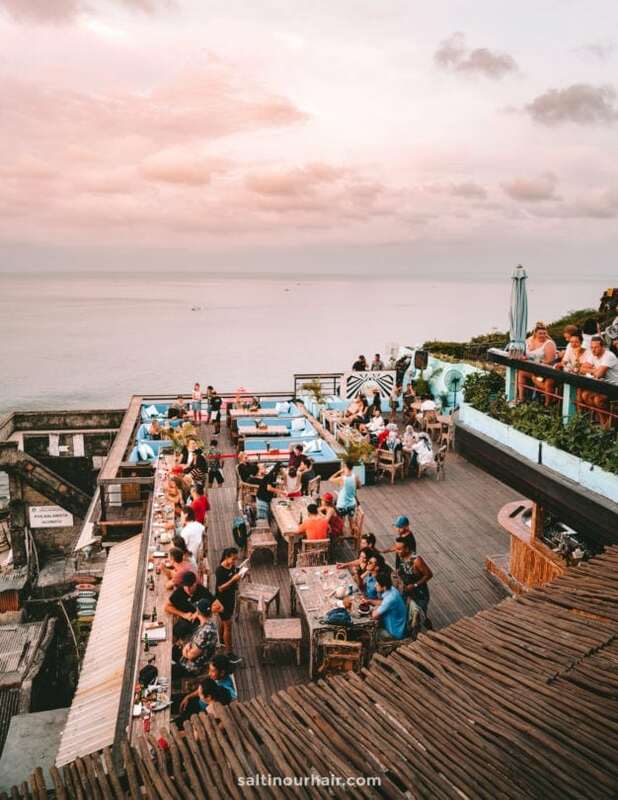 Uluwatu is very trendy with loads of beach clubs and delicious restaurants. 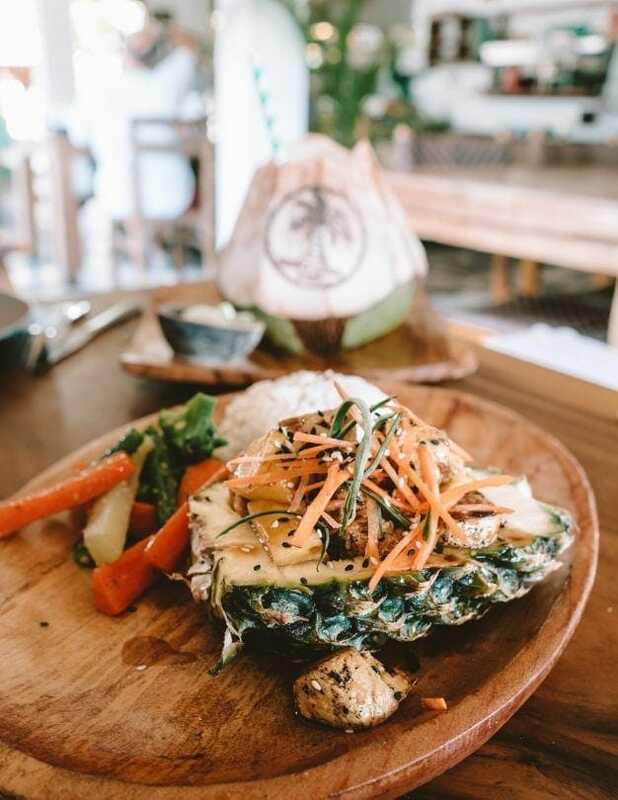 These are our favorite restaurants in Uluwatu. It is best to find accommodation in the Pecatu area. 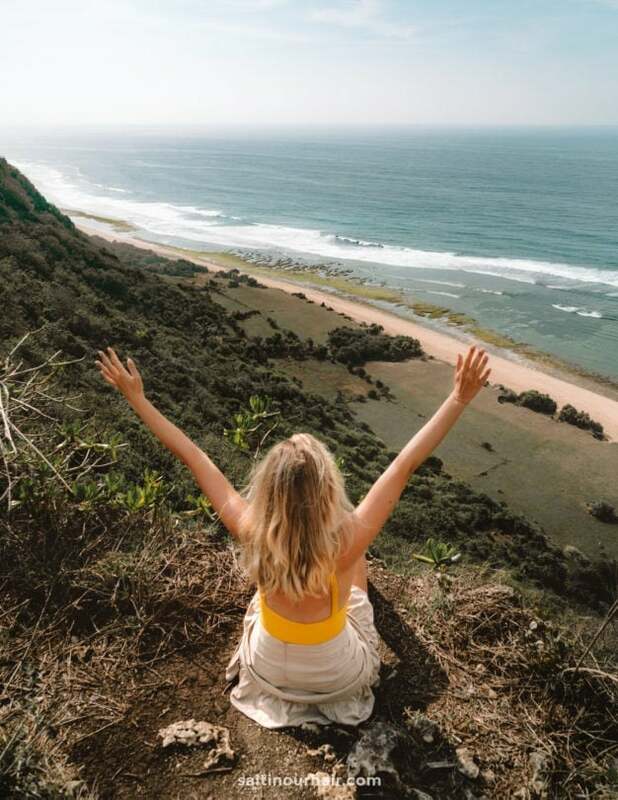 From there, all major things to do in Uluwatu are within a 20-minute motorbike ride. 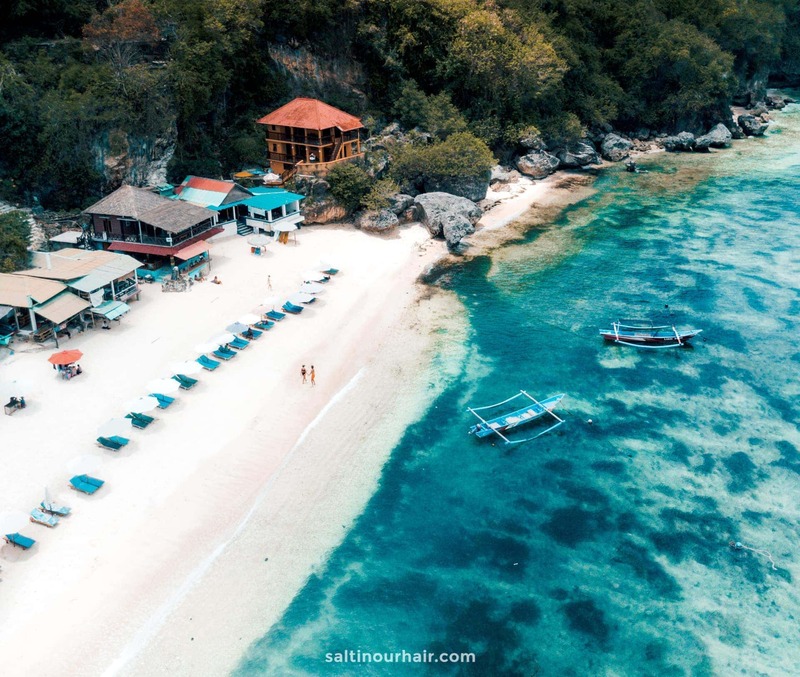 Another popular and even quieter area is all the way down south in Ungasan which hosts Omnia Dayclub, Sundays Beach Club, and The Edge. The surf vibe is more in the area of Uluwatu Temple and Single Fins. 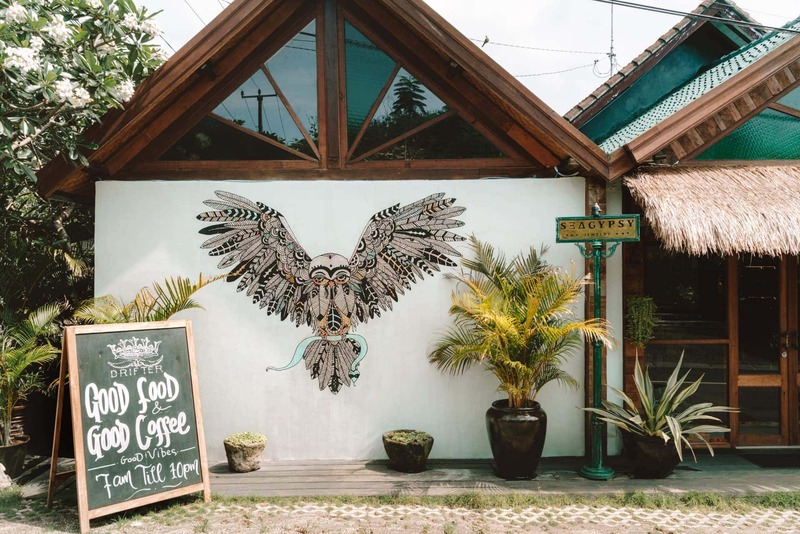 ➳ Get $35 off your AirBnb booking in Uluwatu. 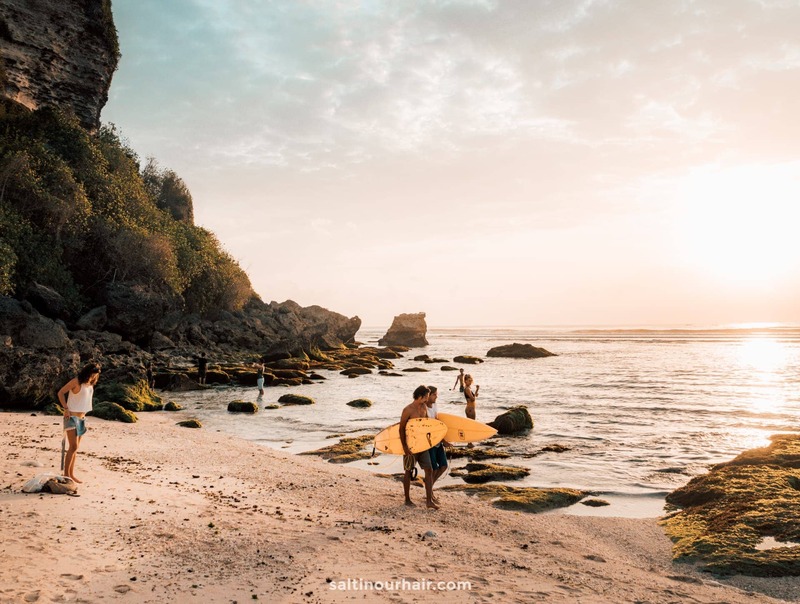 Uluwatu is located about 45 minutes from the airport and 1.5-hour from the popular areas Kuta, Seminyak & Canggu. The best way is to get a taxi or Grab to Uluwatu which costs about 175.000 IDR (10 USD) from the airport. The best way to get around Uluwatu is by motorbike. You can rent a motorbike for 60.000 IDR per day and explore the entire area. 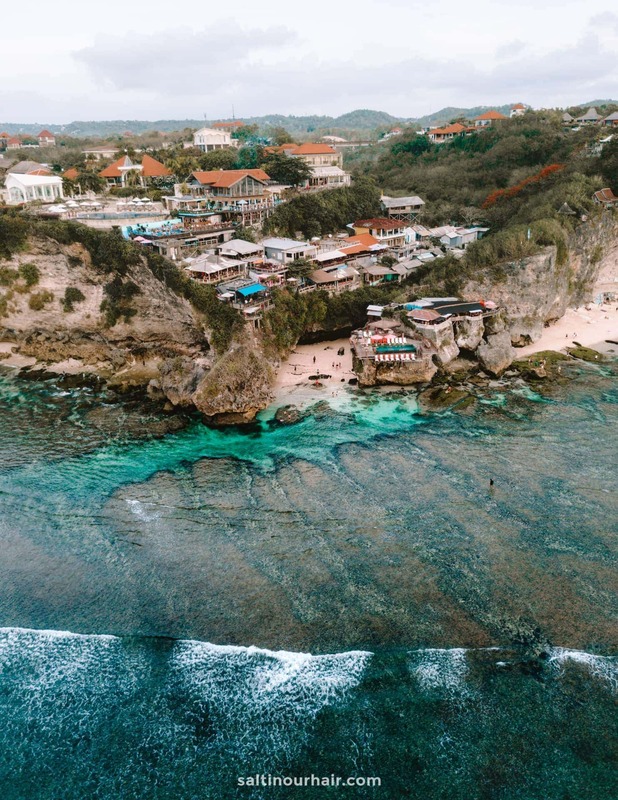 Uluwatu is quiet compared to other areas in Bali, so it shouldn’t be too hard to drive around. Other options are Grab, Gojek or Taxi. A driver can get you to a lot of highlights in just one day. Our buddy Yande is the best! 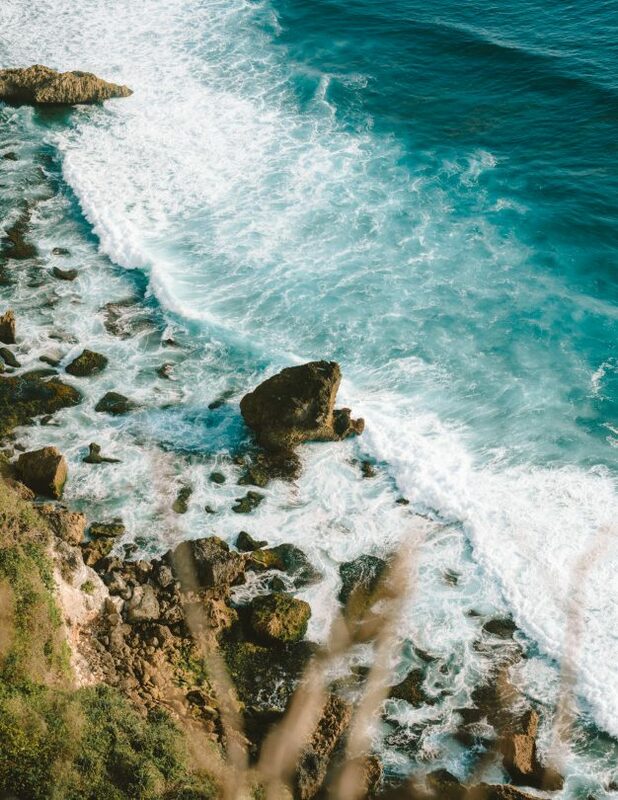 The best time to visit Uluwatu is between April and October. Expect a little more rain in the months March and November. 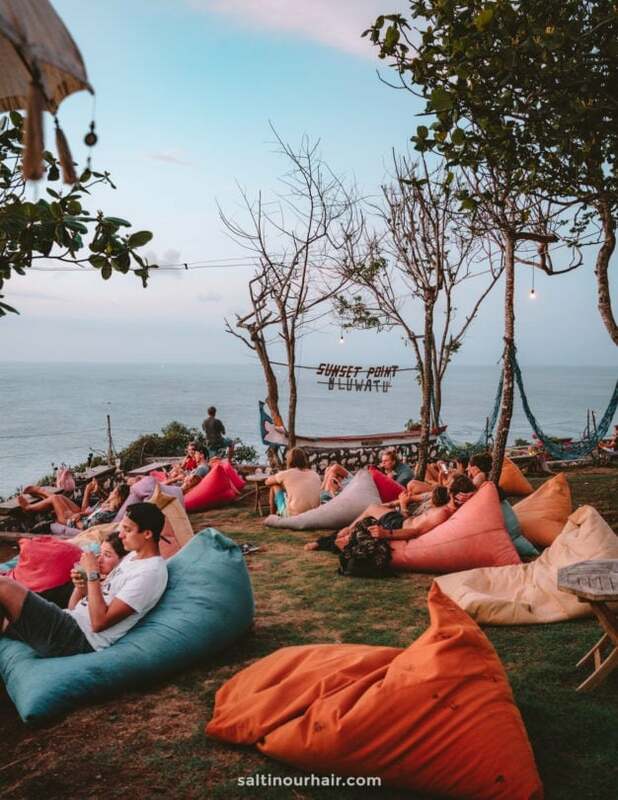 Uluwatu offers a hostels, guesthouses and hotels for every kind of budget. Search hotels or B&B’s.